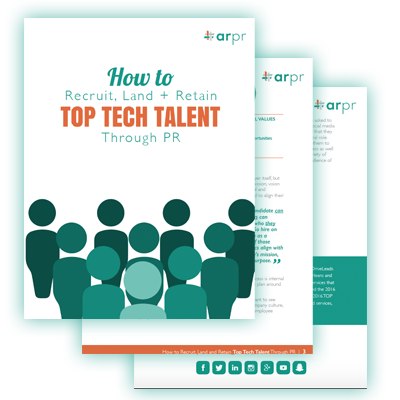 How do tech companies compete for scarce talent? Smart companies are leveraging PR and marketing not just to drive awareness and sales, but to become an attractive place to work as well. Today’s tech landscape is fiercely competitive. The industry continues to experience higher staffing demands than there are resources. In fact, current unemployment in the IT space is in the negative percentile – a statistic that is expected to continue to decline. "I got a LinkedIn InMail from a guy that said he found out about our company because he read a Mashable article about us. He was not looking for a job, but told me he saw the article and thought ‘If I’m going to leave my job it’ll be for a company as cool as this one’ – he’s now our VP of Sales."